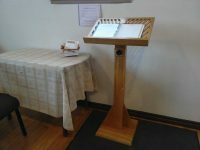 Compassionate Connections is an ongoing Westwood program offering support for congregation members, friends & staff experiencing challenges in their lives. It supplements Sunday services ritual of candles of care & concern; Westwood minister’s professional pastoral care & congregational care networks that naturally arise during tough times. A core element of the program is a Compassion Bank providing tangible support. Special Offers are part of the bank’s offerings where folks offer particular gifts to others. Another key element is the Compassion Log. 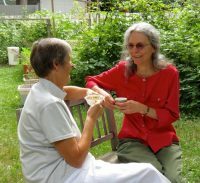 Founded on UU principles, Compassionate Connections offers avenues for friends, members & staff of Westwood congregation to engage with & comfort each other in challenging times. As well, it deepens connections among Westwoodians for the well being of the larger community. It demonstrates the benefits of belonging to Westwood Unitarian Congregation‘s caring community.